What farm equipment will I need? You’ve decided that you want start a farm business. Where do you go from there? Once you know what type of farming you’ll be doing, the next step is to understand which equipment you’ll need. Farm equipment isn’t all about tractors and harvesters either. Trailers and haymakers – as well as feed and supplies for crops or livestock – are just some of the other equipment you may need to consider. The Agricultural Engineers Association (AEA) estimated that new farm equipment sales in the UK were worth £1.75 billion in 2017. This is an increase of £250m from the previous year. Whether you’re looking to buy or rent, or are interested in new or second-hand items, we’ll provide detailed information about the equipment you’ll need for your farm to thrive. What are the main types of agricultural farm machinery? 1. What are the main types of agricultural farm machinery? 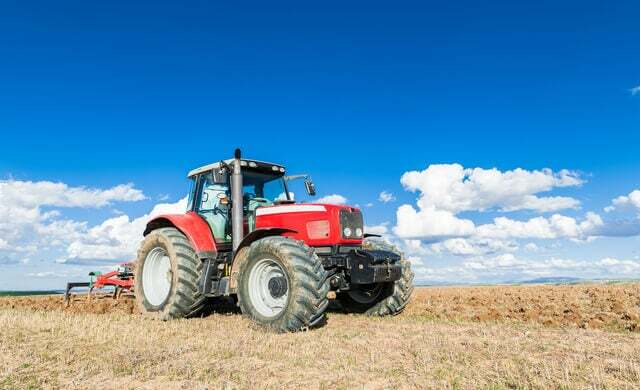 While there’s a vast array of farm machinery out there, in this section, we’ll guide you through the key agriculture equipment you need to run a farm. The machine you use will depend on the quality of soil on your farm, which may vary across your land. A plough is an example of this kind of machinery. As the soil can vary, you may need more than one of these, so renting them is likely to be the most cost-effective option. A second-hand soil cultivation machine can range in price from £1,000 to £30,000 approximately, and will depend on the intensity of the cultivation your farmland requires. These are also known as seeders. There are various ways of getting the seed into the soil – some machines may use a tub, while others may spread it on a belt, for example. If you intend to buy a used seeder, ensure you check inside the machine for wear and tear. 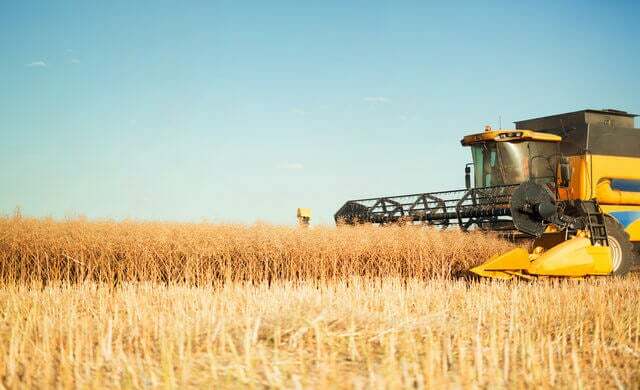 You’ll need to balance your budget with the time you have for seeding – a higher price item may be able to perform the additional steps of spraying herbicides, fertilisers and water too. A used seeder for sale can be priced in the region of £1,000-£5,000. This type of machinery is used to water fields, as well as to drain them. Assess your land to work out how it will need to be drained to find the right irrigation system for your farm. Irrigation machines are often available in parts as well as whole units, so prices can vary considerably. These are used seasonally, depending on how often your crops will grow. It’s wise to consider renting these or buying a second-hand machine, as they can be very expensive, with prices ranging from £3,000 to £100,000+. An example is a combine harvester, which is used to cut and separate crops into the parts that can and can’t be eaten. Others examples include harvesters that are used for potatoes or flax. This keeps hay in a certain shape. That’s how the round or square shapes of hay you see in fields are maintained. You can expect to pay £1,000-£4,000 for a used hay baler, although it’s also possible for balers to exceed £10,000. A fairly comprehensive set of tools is necessary when running your own farm. Some key items to include in your kit are a pitchfork, a rake and a shovel, as well as a wheelbarrow. A scythe is also useful for mowing, especially on small farms which may not have the land area to require a mechanical mower. Whatever items you opt for in the end, be sure to try out any agricultural farm machinery before buying, if possible. When buying machinery, be sure to check health and safety requirements. This includes looking for defects, such as missing buttons or damaged power cords. Also, you should find out if there’s an instruction manual and if you need any specialist training to use the equipment. The Health and Safety at Work legislation states that all new machinery, equipment and vehicles that are sold must be CE marked, which shows that they meet essential safety standards. Note that other requirements apply for used equipment. Read the health and safety guidance for farm machinery and vehicles for more information. You may be wondering why tractors aren’t included in this section – see below for the farm vehicles section to find out more about this essential item. There are a lot of agricultural suppliers in the UK, so knowing which ones to choose can be tricky. In this section, we’ll provide more information about agricultural suppliers, including tips on the decision-making process as well as profiles of some of the key suppliers you should know about. Price – as with any business decision, what you can afford is likely to be a key driver when selecting suppliers. This applies in agriculture too, so consider who supplies the products you need at a price point that matches your budget. Regional – many suppliers in the UK work on a regional basis, so they’re likely to know the demands of your specific area (land and soil quality, for example, as well as weather and other seasonal changes). Specialism – many providers in this sector cater for a few specialist areas. Be sure to choose a supplier that specialises in the particular goods or products you require, such as fencing, livestock or storage. Delivery – you should think about how items will get to your farm. Some suppliers offer delivery services across the country, while others’ delivery options are in certain areas only. Also, check if delivery is included in the price of the goods, or if additional fees will apply. Now you know which equipment you need and how to choose the right supplier for your business’ needs, the next step is find out where to source the items from. To help you get started, we’ve listed a selection of agricultural suppliers located across the country. Farm & Country Supplies provides items for farms, including smallholdings. It also supplies fencing and gating materials, as well as equine products. The Farm & Country Supplies store is located in Essex and offers free delivery in select areas of south-east England. Started by a group of farmers, Mole Valley Farmers offers agricultural supplies online and across the UK. It offers products ranging from animal care to tools and machine parts, to name but a few. Based in Northumberland, Robson & Cowan provides farm, garden and general country supplies to the rural community. It specialises in garden equipment and machinery and offers a delivery service in the local area. StowAg is a Gloucestershire-based agricultural supplies store, with an online shop too. It offers supplies for many farming needs, including animal supplies and fencing materials, as well as security and machinery items. It offers a team of regional reps who travel to farms for animal health requirements. Founded in 1918, Wynnstay Agriculture offers supplies for animal feed and farming crops online, as well as retail shops in more than 50 locations across north, west and south-west England and Wales. Once you’ve figured out the equipment you need and who supplies it, ensure that you have sufficient premises to store it in. Whether you’re looking for a barn, a shed or a warehouse, read our article on agricultural building prices to get an idea of how much you’ll need to budget for this key aspect of a farm business. Tractor sales (and associated parts and accessories) make up nearly half of the total amount that farmers spend on equipment, according to data published by the AEA. A tractor plays a crucial role in the day-to-day workings of a farm. The size, functionality and price will vary, depending on what you need it to do. This is affected by the land area and crop type. A tractor is likely to take up a great deal of your budget, so consider alternatives to buying, such as renting or hiring. A low-cost used tractor is likely to be around £3,000-£10,000, while higher grade models can be priced around £20,000+. More expensive options are available too, for farms that require increased functionality. In addition to the tractor itself, you’ll should consider which tractor implements you need – such as mowers, seeders, hay balers or manure spreaders. An alternative to a tractor is a pickup truck. This can be used on a very small farm business, or for completing specific tasks out in the fields on a larger farm. You may also want to consider attaching a trailer to it – a horse box or other form of livestock transportation, for example. Used pickup trucks for sale are available from £2,000 approximately, although prices increase steadily as the trucks become newer, have less mileage or offer additional features. Depending on the type and size of equipment you’re transporting, you could consider a large van – check out our pages on vans for business for more information. As you would when buying a car, look at reviews online and compare quotes for different models. Once you’ve made a decision, be sure to take the tractor or truck for a test drive before purchasing it. Similarly, tractors should be roadworthy, and their licence plates may need to be registered with the Department for Transport. Look at the government guide on tractor regulations for more details. From reading this article, you’ve developed an understanding of the farm equipment you’ll need to run a working farm. We’ve offered advice on the machinery, suppliers and vehicles necessary for an agricultural business. Now that you know what equipment you need, the next step is to consider your property budget – read our page on agricultural building prices for a better idea.